eInterventional X-Ray (H.A., D.R., F.v.N. ), Philips Healthcare, Best, the Netherlands. BACKGROUND AND PURPOSE: Digital subtraction angiography is the reference standard technique to evaluate intracranial vascular anatomy and used on the endovascular treatment of vascular diseases. A dedicated optical flow-based algorithm was applied to DSA to measure arterial flow. The first quantification results of internal carotid artery flow validated with Doppler sonography are reported. MATERIALS and METHODS: We included 22 consecutive patients who underwent endovascular procedures. To assess the sensitivity of the algorithm to contrast agent-blood mixing dynamics, we acquired high-frame DSA series (60 images/s) with different injection rates: 1.5 mL/s (n = 19), 2.0 mL/s (n = 18), and 3.0 mL/s (n = 13). 3D rotational angiography was used to extract the centerline of the vessel and the arterial section necessary for volume flow calculation. Optical flow was used to measure flow velocities in straight parts of the ICAs; these data were further compared with Doppler sonography data. DSA mean flow rates were linearly regressed on Doppler sonography measurements, and regression slope coefficient bias from value 1 was analyzed within the 95% confidence interval. RESULTS: DSA mean flow rates measured with the optical flow approach significantly matched Doppler sonography measurements (slope regression coefficient, b = 0.83 ± 0.19, P = .05) for injection rate = 2.0 mL/s and circulating volumetric blood flow <6 mL/s. For injection rate = 1.5 mL/s, volumetric blood flow <3 mL/s correlated well with Doppler sonography (b = 0.67 ± 0.33, P = .05). Injection rate = 3.0 mL/s failed to provide DSA–optical flow measurements correlating with Doppler sonography because of the lack of measurable pulsatility. CONCLUSIONS: A new model-free optical flow technique was tested reliably on the ICA. DSA-based blood flow velocity measurements were essentially validated with Doppler sonography whenever the conditions of measurable pulsatility were achieved (injection rates = 1.5 and 2.0 mL/s). Even though digital subtraction angiography has traditionally been confined to standard anatomy assessment, quantification of blood flow based on DSA is becoming an important topic that could help neurointerventionists in making adequate peri-procedural decisions. Some reports have described new techniques based on DSA that are able to assess flow or flow changes during treatment of stented aneurysms.1,2 However, the development of clinically useful tools based on the integration of engineering, hemodynamic and physiologic knowledge still requires improved translation of biofluid mechanical information into clinical applications.3 X-ray video densitometry, based on the detection of the displacement of radiopaque contrast material through the vascular system, has been studied since the early 1960s and has been divided into 2 main classes: tracking and computational methods.4 Sarry et al5 estimated the flow by using an inverse advection model. Bogunović and Loncarić6 proposed the combination of DSA and 3D rotational angiography (3DRA), using an analysis of the time-attenuation curves. Rhode et al7 developed a model-based and weighted-optical field (OF) approach to improve already existing techniques and compared the results with simulation data, while Imbed et al8,9 developed a similar approach on the femoral artery and simulated angiographic data. Waechter et al10 developed a model-based approach to measure flow in the cerebral arteries. These approaches were all limited in case of fast flows, required longer straight-vessel segments, and were affected by low signal-to-noise ratios. A dedicated algorithmic scheme was developed to reduce instabilities due to temporal and spatial noise and to cope with fast flows, to address these issues.11 Essentially, we used only the modulation by the cardiac cycle to extract flow-velocity values. The OF principle was then applied to the pulsating component of dye-concentration signal.11 In this article, the first clinical results of the proposed algorithm applied to the ICA are reported. The clinical implementation and verification against Doppler ultrasound (USD) data in a consecutive cohort of patients are described, and the limits of the current technique are discussed. The study protocol was approved by our institutional ethics committee (NEC 07–056). Between 2008 and 2009, all patients undergoing angiographic investigation or endovascular treatment for intracranial aneurysms in our department were considered for recruitment. Patients with intraventricular drainage, hydrocephalus, or hematoma were excluded because of a possible unstable intracranial pressure that could interfere with intracranial flow during the procedure and image acquisition. We included prospectively 22 consecutive patients with ruptured or unruptured intracranial aneurysms. All patients were evaluated under general anesthesia. A 5F 0.038-inch diagnostic catheter (Cook, Bloomington, Indiana) was placed selectively in the ICA (3 cm after the common carotid bifurcation) by using a femoral approach. The angiographic examinations were performed with a monoplane angiographic C-arm Allura FD20 system (Philips Healthcare, Best, the Netherlands). Every patient underwent 3DRA to acquire the 3D vascular anatomy with an injection rate (IR) = 3 mL/s during 6 seconds. An optimized projection, offering the best view of the vessel segment, was chosen for flow-rate measurement with the fewest overlapping vessels. High-speed DSA (60 frames/s with the 1024 × 1024 detector pixel matrix) was acquired in 10 seconds. The radiation exposure was equivalent to 2-frames-per-second sequences in terms of dose level. Two or 3 DSA acquisitions by using different contrast agent IRs were obtained for each patient. The contrast agent (CA) was iopamidol (Iopamiro 300; Bracco, Milan, Italy), and the injection duration was 3 seconds. CA was injected with an Imaxeon Avidia angiographic contrast injector (Medrad, Indianola, Pennsylvania). IRs were randomly selected before each acquisition among 3 protocols: 1.5 mL/s (n = 19), 2.0 mL/s (n = 18), and 3.0 mL/s (n = 13). where L is the curvilinear length of the arterial segment. S(z) is measured from the segmented vasculature in the 3DRA dataset. Figure 1 summarizes the whole velocity-extraction process,11 starting from the DSA and 3DRA acquisitions (Fig 1A). The centerline of the artery was used to determine the curvilinear path represented by z. The contrast-level intensity along the curvilinear length z, namely the flow map or contrast wave map,10,12 is represented in Fig 1B. The velocity profile extracted from the flow map along with the volumetric flow is represented in Fig 1C. Flowchart illustrating the treatment of DSA images to calculate the blood flow of patient 3. First, the 2D images are superimposed on the 3DRA to scale the distances on the 2D images (A). Next, the contrast values are distributed over a straight model (B) to extract a flow map from the contrast sequence. Last, the flow map is analyzed by using the optical flow principle to estimate flow velocity curves (C). The volume flow rate curve is estimated by using the section of the artery measured from the 3DRA volume. To ensure good mixing between CA and blood, we selected the region of interest in the ICA at least 10 arterial diameters from the injection site.13 The region of measurement was reachable by submandibular USD examination. The ICAs were examined by an experienced investigator with a 5- to 11-MHz color-coded duplex linear probe connected to an Aplio 770A scanner (Toshiba Medical Systems, Tokyo, Japan) by using a standard technique.15 The sample volume, adjusted to the size of the artery, was placed in the ICA with a submandibular approach, to obtain velocity waveforms. Its placement was adjusted around the site of measurements to acquire the higher color-coded signal. The angle-corrected mean velocity, peak systolic velocity, and end-diastolic velocity were determined by tracing the maximum frequency envelope of the waveform. The reference flow curves, based on Womersley solutions, were extracted with a Matlab (MathWorks, Natick, Massachusetts) program from images of velocity profiles acquired with USD. The vessel diameter needed to estimate the volumetric flow rate was measured on the 3D reconstruction. For cases in which several USD measures were acquired, repeatability was estimated. The slope b and offset a were the regression coefficients of the robust fit model. The analysis was made for every injection rate group separately (1.5, 2.0, and 3.0 mL/s) and for several QD thresholds (QD ≤ 3.0, ≤4.0, ≤5.0, ≤6.0, ≤7.0 mL/s) to test the volume flow limits of the current OF technique prototype. Ideally, the 95% CI of the regression slope estimate should contain the value 1. The y-intercept a coefficient was proportional to the CA injected volume flow and was not taken into account in the validation process because of the lack of knowledge of this factor.18 Nonparametric Wilcoxon rank sum U tests and the Kruskal-Wallis H test were used to test statistics for the continuous data: b-slope regression coefficient, injection rate quotient, and Doppler measurement precision. If the H test was significant among 3 groups, the U test was performed to find out which of the differences were statistically significant. The significance level was fixed to α = .05. The On-line Table summarizes the measurements from USD and DSA. The average Doppler flow rate of the whole patient sample was 3.2 ± 0.3 mL/s (n = 22). Of the 22 patients, 16 had at least 2 Doppler measures in the submandibular On-line ICA segment: 11 with relative root mean square errors (RMSE) <10% and the rest with RMSE between 10% and 25%. This precision did not depend on the circulating mean flow rate (P = .13). QX volume flow quantification was regressed on the reference USD QD for each injection rate (1.5 mL/s, 2.0 mL/s, and 3.0 mL/s) and for each QD threshold subsample (≤3 mL/s, ≤4 mL/s, ≤5 mL/s, ≤6 mL/s, ≤7 mL/s). Figure 2 illustrates the results for both QD ≤ 4 mL/s (left) and QD ≤ 7 mL/s (right) subsamples. For Qi = 1.5 mL/s (Fig 2A, -B), the regression slopes were b = 0.49 (95% CI, 0.10–0.88; R2 = 0.72) (Fig 2A) and b = 0.42 (95% CI, 0.21–0.63; R2 = 0.84) (Fig 2B), respectively. For Qi = 2.0 mL/s (Fig 2C, -D), the slopes were b = 0.84 (95% CI, 0.40–1.28; R2 = 0.76) (Fig 2C) and b = 0.62 (95% CI, 0.33–0.91; R2 = 0.81) (Fig 2D), respectively. For Qi = 3.0 mL/s (Fig 2E, -F), the slopes were b = 0.35 (95% CI, 0.03–0.67; R2 = 0.71) (Fig 2E) and b = 0.42 (95% CI, 0.16–0.67; R2 = 0.80) (Fig 2F), respectively. The slope bias from 1 significantly increased with the QD threshold for both Qi = 1.5 and 2.0 mL/s groups. Unlike the 2 other IRs, the slope bias for Qi = 3.0 mL/s followed a decreasing trend with increasing QD. A and B, The regression fit at QI = 1.5 mL/s for QD ≤ 4 mL/s (left) and QD ≤ 7 mL/s (right). QX is represented on the y-axis, and QD, on the x-axis. The data (blue star points), fit (red line), and 95% CI limits (magenta) are all represented. C and D, The regression fit at Qi = 2.0 mL/s for QD ≤ 3 mL/s (left) and QD ≤ 7 mL/s (right). QX is represented on the y-axis and QD on the x-axis. The data (blue star points), fit (red line), and 95% CI limits (magenta) are all represented. E and F, The regression fit at Qi = 3.0 mL/s for QD ≤ 3 mL/s (left) and QD ≤ 7 mL/s (right). QX is represented on the y-axis, and QD, on the x-axis. The data (blue star points), fit (red line), and 95% CI limits (magenta) are all represented. The comparison of the regression slope coefficient among Qi groups (Fig 3A) indicated that the only significant difference was between the Qi = 2.0 mL/s and Qi = 3 mL/s groups (P = .0015). The mean slopes, if sampling errors were ignored, were 0.48, 0.75, and 0.35 for Qi = 1.5, 2.0, and 3.0 mL/s, respectively, with SE = 0.06. The corresponding slope upper values for the respective Qi values were 0.84, 1.21, and 0.72, respectively, with a SE of 0.12 (Fig 3B). The Qi = 3 mL/s group was significantly biased compared with both Qi = 1.5 mL/s and 2.0 mL/s (P = .039). For each CA injection rate Qi, the sampling effect on slope driven by QD cutoffs at 3.0, 4.0, 5.0, 6.0, and 7.0 mL/s is plotted in Fig 4A. The error bars are superimposed for the group Qi = 2.0 mL/s. For this group, the slope bias was not significant up to QD = 6 mL/s. Above QD = 5 mL/s, flow quantification was not sensitive to sampling. For Qi = 1.5 mL/s, slope bias was significant (P < .05) for sampling cutoffs of >3 mL/s; and for Qi = 3.0 mL/s, the slope bias was effective for the whole sample (P = .0004). A, the boxplot for the fitted slope (y-axis) at 1.5, 2.0, and 3 mL/s (x-axis). Each boxplot represents the 5 slope values fitted for each QD subsample, with QD thresholds ≤3.0, ≤4.0, ≤5.0, ≤6.0, and ≤7.0 mL/s. B, results of the nonparametric ANOVA multiple comparison of the regression slope upper limit (x-axis) for each injection rate group (y-axis). These summarize the corresponding maximum slope values of 0.84, 1.21, and 0.72 with an SE of 0.12. The 95% CI error margins are also represented. A, Slope versus QD for injection rates Qi = 1.5 (blue), 2.0 (red), and 3.0 mL/s (green). The 95% CI limits have been superimposed to Qi = 2.0 mL/s points. The graph shows that the slope bias calculated is not significantly different from 1 up to QD = 6 mL/s (P > .05). The Qi = 1.5 mL/s group (blue points) follows the same evolution trend as Qi = 2.0 mL/s, though with accentuated bias. A nonsignificant slope bias is likely for the QD range below 3 mL/s (P = .06). B, Injection rate quotients for Qi = 1.5 mL/s (group 1), 2.0 (group 2), and 3.0 mL/s (group 3). The blue bars correspond to quotients <1.2, and the red bars, to quotients >1.2. The fact that the Qi = 1.5 and 2.0 mL/s groups are reconstructed in similar ways with minimum slope bias, unlike the Qi = 3.0 mL/s group, is partly due to differences in injection rate quotients (P = .01). The ratio between the injection rate and the mean blood flow is illustrated in Fig 4B. The groups Qi = 1.5 and 2.0 mL/s were not different (P = .85), while both of them were different from the Qi = 3.0 mL/s group (P = .01). In the first 2 groups, 90% of the data points had an injection rate quotient < 1.2, implying that physiologic information and modulation were conserved in contrast-motion patterns.14 In the Qi = 3.0 mL/s group, 45% of the points had an injection rate quotient > 1.2. Therefore, the optical flow measures significantly matched the Doppler outcome for 2.0 mL/s injected cases when circulating blood flow ranged between 1 and 6 mL/s. With a 1.5 mL/s injection rate, flow measures matching was for circulating blood flow ranging from 1 to 3 mL/s. Figure 5 shows, for case 13, the contrast wave maps and flow curves corresponding to IR = 1.5, 2.0, and 3.0 mL/s. As one can notice, the contrast wave maps corresponding to IR = 1.5 and 2.0 mL/s show the best premises for velocity extraction (several pulses) compared with IR = 3.0 mL/s (1 detectable pulse). Comparison of contrast wave maps (top) and flow curves (bottom) for patient 13 for different IRs: IR = 1.5 mL/s (left), IR = 2.0 mL/s (middle), and IR = 3.0 mL/s (right). The red and blue curves in the bottom images correspond to USD and DSA measurements. In our study, we used 3 different IRs: 1.5, 2.0, and 3.0 mL/s. The Craya-Curtet number was 0.5–0.9 with a 5F catheter of 0.035-inch inner diameter, the tip of which was positioned at least a 10-artery diameter below the measurement zone.13 Measurable flow pulsatility was obtained for IR = 1.5 mL/s and 2 mL/s (injection rate quotient ≤ 1.2).13,14 Consequently, the OF technique performance was reasonably high, with slightly better results for 2 mL/s and for volume flows of <6 mL/s. The performance with IR 1.5 mL/s was lower than expected because of the larger dilution of the dye with a deleterious effect on signal-to-noise ratio. The injection at 3 mL/s presented excessive reflux at the injection site, which altered the matching between dye and blood-flow dynamics in the region of interest. The general trend of our current OF algorithm was to measure flow with an underestimated slope bias that depends on the injection rate: 0.48, 0.75, and 0.35 for Qi = 1.5 mL/s, 2.0 mL/s, and 3.0 mL/s, respectively, with RMSE = 0.06. Those values do not take into account sampling errors. The maximum slope value variations (95% CI) over the whole QD show that the slope bias for Qi = 1.5 and 2.0 mL/s was not statistically significant (the maximum slope is, respectively, 0.84 and 1.21, with RMSE = 0.12, P = .05), unlike that for IR = 3.0 mL/s group. This general trend is consistent with the fact that the performance of the OF method depends first on the presence of the physiologic information on contrast wave maps and, consequently, on the injection rate quotient (≤1.2). 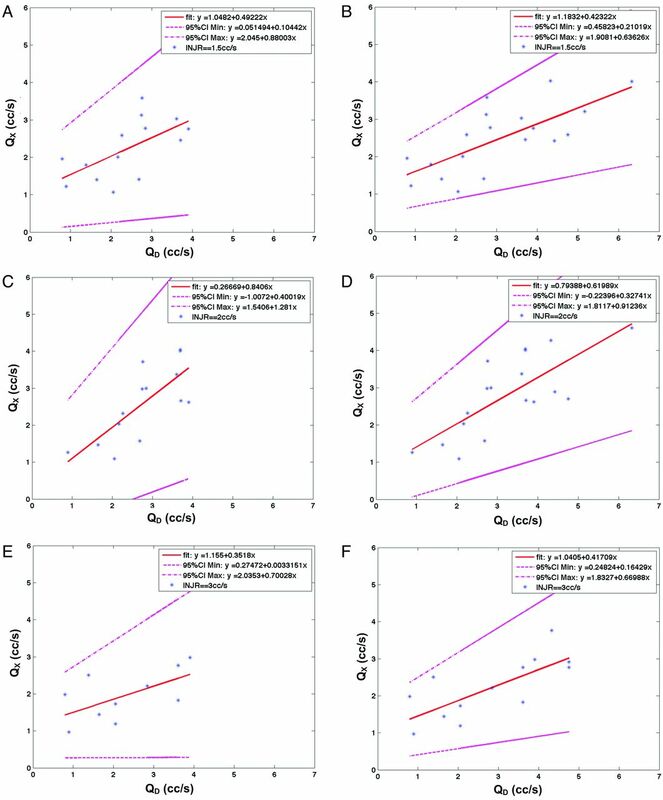 Thorough examinations of slope dependency with QD show that the slope bias for group IR = 2.0 mL/s was not statistically significant (P > .05) up to 6 mL/s, setting the limit on reliable velocity measurement to 60 ± 6 cm/s, taking into account the average inlet diameter of 4.8 mm and the relative RMSE = 0.12. For the IR = 1.5 mL/s group, the slope bias was small, within QD ≤ 3.0 mL/s, and increased with QD. As QD increases, the corresponding CA signal-to-noise ratio is reduced, possibly because poor mixing occurs at the injection site due to high Craya-Curtet number.7,13 Consequently, intensity gradients in 2D images would have been overestimated in the denominator of the OF equation. More improvements to the OF technique are expected in the near future to cope uniformly with different injection rates and flow rates. The OF trend and limitations presented in the above section are discussed under the assumption that USD measures are infinitely accurate, which is, in fact, not correct. Biases due to geometric spectral broadening and to angulations between the beam direction and the vessel axis may lead to an overestimate of the USD velocity of approximately 30%.23 The Doppler measurement repeatability inherent to the experienced investigator was reasonable (<23%). However, the mean-flow-rate repeatability of the measurements was <15% in 13 of 16 cases that had at least 2 USD measures, and for the other 3, it was ≤23%. The volumetric flow shapes were similar for repeated measures. Sources of mismatch between OF and USD could have been due to the delay between the 2 acquisitions or to inaccurate estimates of the parent artery diameter from the 3D geometry. The diameter is influenced by the threshold selection and by the location of the measurement on the artery, which could deviate from the USD measurement zone. In this work, we focused on the most rectilinear part of the internal carotid artery to ensure the reliability of USD velocity measurements. In the submandibular part of ICA, the vessel narrowing is negligible within the OF measurement-segment length (2 cm). The range of flow rates in the ICA is quite exhaustive to validate the method. Nevertheless, it will be necessary to validate in other cerebral vessel locations where flow rates are smaller. The DSA-based OF approach can be used to measure circulating flows in ICAs. The OF measure was validated with USD for flows up to 6 mL/s with CA injected at 2.0 mL/s and up to 3 mL/s with CA injected at 1.5 mL/s. The values obtained from the IR = 3.0 mL/s group were significantly biased because only partial dynamic information was propagated to the CA motion pattern. Improvements to the OF technique are expected in the near future to improve the accuracy and uniformity of velocity measurements over ranges of flow rates and injection rates. 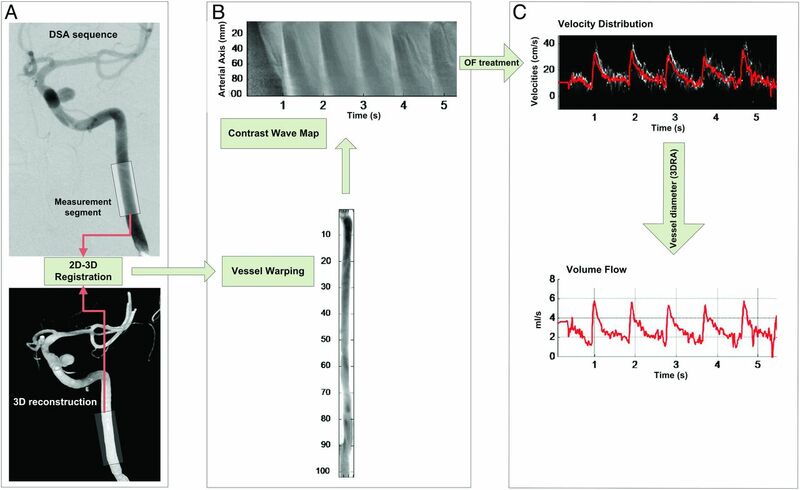 The capability of using this technique during the procedures and assessing fast flows in cerebral vessels would open new insights in intraoperative therapeutic decision-making. The linear regression method we used applies generally to cases in which the independent variable (QD) is free from errors. In such situations, the robust fitting method consistently rejects the outliers and focuses on the bulk attenuation of data points. In our case, because 16 of 22 points were characterized by an estimated error on QD, errors-in-variables regression methods would have been used (eg, Deming regression) to avoid underestimating the regression coefficients. Some OF and Doppler measures were unique, and using Deming-like regression would have led to speculations on relative variances. Requiring that all data points have more than a single measure simultaneously in either OF or Doppler would have reduced the number of points by 50%. The robust regression fit is then a reasonable compromise to capture trends of the optical flow method. The H test is generally performed among groups that are statistically independent. In our study, QD cutoff-based subsampling created the 3 IR (Qi) groups. However, with such a low number of points (5) in each group, the lack of that statistical independence should not have dramatic consequences, given the level of precision and accuracy that we were dealing with. For several decades, the potential of Doppler instruments to measure volume flow rates at the same time as velocity waveforms has been discussed.24 One article has reviewed all of the factors of inaccuracy and provided the orders of magnitude of the errors that were derived from the Doppler acquisition constraints and that were evaluated during validation tests.23 Validation experimentation estimates the performance of the technique with in vivo and in vitro tests.25 The authors found errors in the range of 5%–54% for in vivo experiments and errors <18% for in vitro flow-phantom experiments. Disclosures: Vitor Mendes Pereira—RELATED: Grant: Swiss National Foundation. * Odile Bonnefous—UNRELATED: Employment: Philips Research Paris. Jean Stawiaski—UNRELATED: Employment: Philips Research. Fred van Nijnatten—UNRELATED: Employment: Philips Medical Systems Nederland BV (a Philips Healthcare Company). Hans Aerts—UNRELATED: Employment: Philips Healthcare. Daniel Ruijters—UNRELATED: Employment: Philips Healthcare. *Money paid to the institution. This work was supported by Swiss National Funds (SNF 32003B_141192 and SNF 320000_121565).